Toshiba International Corporation today announced the development and availability of the new Petrochem SD+ medium voltage motor. The totally enclosed and fan cooled Petrochem SD+ motor package features rugged construction and durable design ideal for the toughest material processing applications. Built with certain IEEE Std. 841™-2009 specifications, the Petrochem SD+ motor is made for the oil and gas, mining and mineral, and pulp and paper industries. Toshiba International Corporation (TIC) today announced the development and availability of the new Petrochem SD+ medium voltage motor. The totally enclosed and fan cooled Petrochem SD+ motor package features rugged construction and durable design ideal for the toughest material processing applications. Built with certain IEEE Std. 841™-2009 specifications, the Petrochem SD+ motor is made for the oil and gas, mining and mineral, and pulp and paper industries. Available in 2300, 3300, 4000, or 6600 V, the Petrochem SD+ medium voltage motor features severe duty IP55 protection for the motor and terminal boxes, in addition to an insulation system capable of withstanding an immersion test in accordance with NEMA MG 1. Further protection from environmental conditions is evident in the tropicalization treatment on windings, rust-inhibitive paint system on motor and rotor/shaft assembly, and corrosion-resistant hardware. Since 1970, TIC has developed a proud tradition of producing some of the most reliable, robust motors in the market. With in-house design, engineering, and manufacturing capabilities, TIC can completely customize each motor to specific application requirements. Many of these products are designed, built, and tested in a 1,000,000+ square foot state-of-the-art manufacturing facility in Houston, Texas. 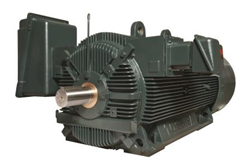 TIC offers a wide range of medium and high voltage motors in open machines and totally enclosed air & water cooled enclosures in squirrel cage induction machines (SCIM), wound rotor induction machines (WRIM), and synchronous designs ranging from 100 HP to 50,000 HP and 2,300 to 13,800V. The TIC Motors & Drives division, which offers a full range of adjustable speed drives and motor controls, is anchored by a totally integrated manufacturing process; research and development, design, engineering, production and manufacturing, and after-market service and support are all commandeered under one single roof. With the capability to test products together as a complete system before sending out into the field, TIC ensures the highest level of quality, performance, and reliability. TIC is a Toshiba America Inc. (TAI) Group Company, a wholly owned subsidiary of Toshiba Corporation. TIC is headquartered in Houston, Texas and employs approximately 1,400 people. TIC provides application solutions to a wide range of industries including industrial, power systems, and transmission and distribution systems. For more information about TIC, please visit http://www.toshiba.com/tic.